Heartburn Medications Can Come With Serious Side Effects : Shots - Health News Millions of people take proton pump inhibitors. But the drugs can increase patients' risk of infections, bone fractures and kidney problems. And trying to stop the drugs can make symptoms much worse. When Marcella Lafayette started having really bad heartburn, she went to her doctor to see if there was anything that might help. "I was experiencing a lot of chest pain, back pain caused from heartburn," says Lafayette, 62, of Portland, Ore. Her doctor diagnosed her with gastroesophageal reflux disease, or GERD, and prescribed a drug called a proton pump inhibitor, or PPI. The drug worked, but Lafayette soon started having other problems, such as muscle weakness and severe leg cramping. Lafayette discovered she was suffering from a magnesium deficiency, a side effect of the drug. She also learned that PPIs can cause not just deficiencies of nutrients but other side effects, such as an increased risk for infections. So Lafayette decided to try to stop using her PPI. But whenever she did, her heartburn returned. And the symptoms were much worse. "I can't seem to get off the drug, because when I do, I experience severe stomach pain. I can't eat anything without experiencing stomach pain," Lafayette says. "It just feels like you've got a knife in your gut. It's just really painful." Lafayette is not alone. Many people have trouble discontinuing PPIs because the amount of acid in their digestive system surges when they stop taking the drug. Experiences like Lafayette's, and rising evidence that the drugs may be associated with a variety of increased risks, are making doctors increasingly worried about their wide use. "The teaching for many years was that these drugs were quite safe," says John Clarke, a gastroenterologist at Johns Hopkins Hospital in Baltimore. "But there is data that's emerging that suggests PPIs may not be as safe as we think they are." 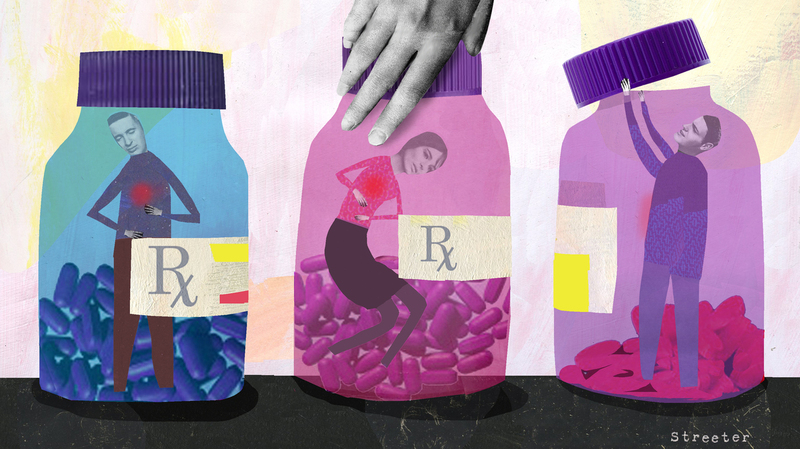 An estimated 15 million Americans use PPIs, which are sold by prescription and over the counter under a variety of brand names, including Nexium, Prilosec and Prevacid. They work by blocking production of stomach acid. And that could be the root of the problem, according to Clarke. Stomach acid helps digest food and also has a "barrier function against different pathogens which are ingested," he says. So when there's less stomach acid, it leaves people vulnerable to nutritional deficiencies and infections, including food poisoning like salmonella, a serious, sometimes life-threatening digestive system infection called Clostridium difficile, and perhaps pneumonia. Stomach acid also helps digest food. So if you don't have any of that acid, it can make it hard to get the vitamins, minerals and other nutrients you need from your food — including nutrients that keep bones strong and prevent fractures. In addition, one recent study suggested people who take PPIs may be at greater risk of heart disease; another suggested the drugs could increase the risk for chronic kidney disease. Updated Feb. 15, 11 a.m. ET: The latest concern is that PPIs might increase the risk for dementia. Britta Haenisch and colleagues at the German Center for Neurodegenerative Diseases in Bonn studied 73,679 people ages 75 and older. The researchers found regular PPI users had at least a 44 percent increased risk of dementia compared with those not using the drugs. The researchers caution that the risk could only be considered an "association," until more research could be conducted to produce more conclusive evidence. But the findings indicate "the avoidance of PPI medication may contribute to the prevention of dementia." How PPIs might increase the risk for dementia is unclear. But other researchers recently reported that, in the brains of mice, PPIs seem to increase levels of a damaging protein that accumulates in the brains of dementia patients, known as beta-amyloid. In an editorial accompanying the study in the journal JAMA Neurology, Lewis Kuller of the University of Pittsburgh wrote that the findings "provided an important and interesting challenge to evaluate the possible association," which is a "very important issue given" how commonly the drugs are used by the elderly, who are already at increased risk for dementia. Our original post continues: As this evidence has emerged, Clarke says, "I think it's imperative that people who take these drugs really make sure that they are looking at the risks versus benefit and people don't use these drugs lightly." Many people take PPIs when they don't really need them, Clarke says. They could get rid of their heartburn by making lifestyle changes, such as losing weight and cutting back on alcohol, caffeine and spicy and fatty foods. And many people stay on them a lot longer than they need them, he says. PPIs are usually supposed to be taken for two to eight weeks, although doctors may recommend more. The companies that make PPIs say they're safe for most people if they use them the way they're supposed to. And doctors say many people really need to take a PPI for severe heartburn. "Proton pump inhibitors do have some very positive benefits to patients," says Kenneth DeVault, a gastroenterologist at the Mayo Clinic who is president of the American College of Gastroenterology. "They relieve symptoms better than any other medication that has ever been developed." The most important "positive effect of proton pump inhibitors is restoration of a quality of life," DeVault says. "This is probably the big one." PPIs may also reduce the risk for esophageal cancer for some people, he says. DeVault says if someone really needs a PPI, they should take one. But they should try everything else first, keep an eye out for any side effects, and talk to their doctor about how long they should stay on it.